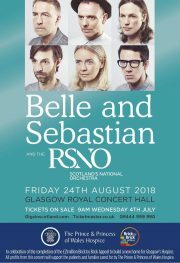 Belle and Sebastian have announced that they will play a very special one off concert with the Royal Scottish National Orchestra in celebration of the completion of the The Prince & Princess of Wales Hospice £21million Brick by Brick Appeal to build a new home for Glasgow’s Hospice. The show will take place on Friday 24th August at Glasgow’s Royal Concert Hall and all profits will support the patients and families cared for by the hospice. The band have also confirmed that Mick Cooke will join them for the show. Belle and Sebastian Invite You To Book Your 2019 Holiday With Them!